Patients who regain after their gastric bypass surgery now have options! Have you started to regain weight after initial success gastric bypass surgery? Over time, the stomach pouch or the outlet that connects it to the small intestine can stretch. As a result, patients can eat more food before feeling full. 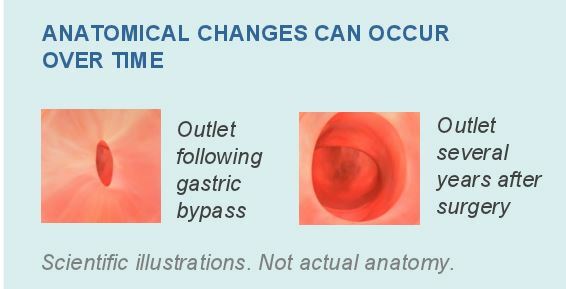 We now offer a safe and effective endoscopic procedure to reduce your enlarged pouch and outlet to their original post-operative proportions. Why would I regain weight after WLS? loss occurs from a dramatic decrease in calories. Many clinicians have shown when the stomach pouch and/or outlet gradually stretch, it takes longer for the patient to feel full. As a result, may begin to regain weight. We now offer qualified patients an endoscopic (non surgical) procedure to reduce the volume of an enlarged pouch and the diameter of the outlet. This procedure is performed using a small flexible endoscope and specialized devices that allow sutures to be placed through the endoscope. The scope and suturing devices are inserted through the mouth into the stomach pouch the same way as a standard endoscope. Sutures are then placed around the outlet to reduce the diameter, typically from the size of a silver dollar to the size of a dime. The same technique may then be used to place additional sutures in the stomach pouch to reduce its volume capacity. What are the benefits of an endoscopic procedure? Scarring and adhesions from the initial WLS procedure often make open or laparoscopic revision surgery very challenging, and at times impossible. Abdominal revision surgery takes longer than the original WLS and patients are three times more likely to develop complications. Having a revision through endoscopic procedure decreases the patients risks when compared to abdominal revision surgery. Patients experience less pain, recover faster and have no abdominal scarring. Typically, patients go home the same day, but each patient’s discharge will vary based on his/her physician’s recommendation. 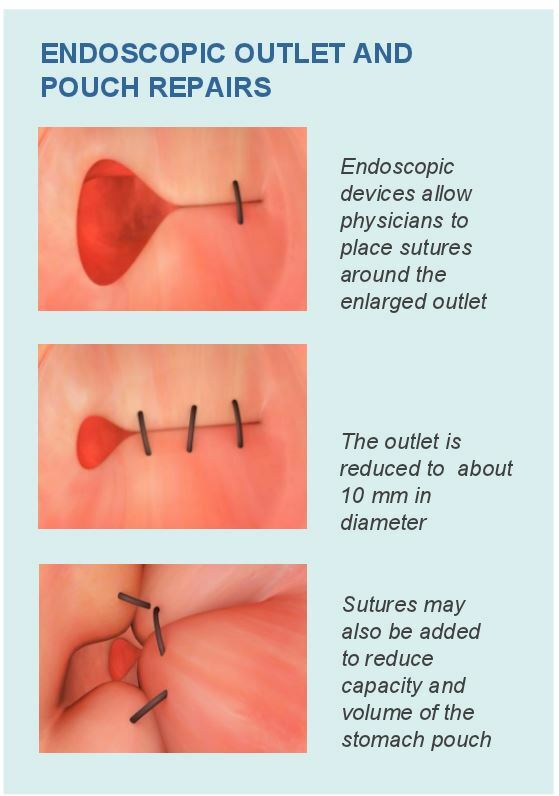 It is anticipated patients will feel little or no discomfort from the endoscopic procedure. Minor side effects may include gas pain, nausea, a sore throat, swollen tongue, and lip pain from the insertion of the endoscope into the mouth. Patients typically return to their normal routine within 48 hours. Following endoscopic outlet and pouch repair, patients should follow the same diet and exercise regimen they did after their initial weight loss surgery. It depends upon the patient’s insurance plan. If not, cash pay options may be available. For further information, patients should speak with their physician.